The combination of AlpenView Wilderness Lodge and Out Camp provides a full gambit of world class sport fishing opportunities. Presenting a dry fly to a twelve inch rainbow, battling a giant halibut and all points in between. We have it all. Learn more about our lodge fishing program. Learn more about our camp fishing program. For more information on fishing for each species, click on the fish’s picture. Halibut are available throughout the season in saltwater. Fishing for halibut is accessed by boat out of the lodge. They average 40 pounds and can go well over 200 pounds. Other saltwater species available to the lodge angler include ling cod, gray cod and black rock fish. Chum salmon are available in July and August. Beginning in saltwater and moving into freshwater as the season progresses. Fishing for Chum is accessed by boat out of the lodge. They average 8 pounds and can go well over 15 pounds. 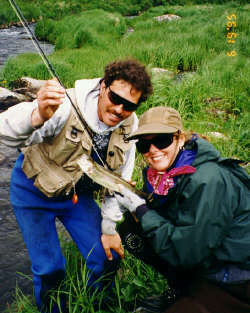 The rivers of Kodiak Island are vary well suited to the sport of fly fishing. In contrast to many rivers in Alaska, they are relatively small, easily waded, and clear. 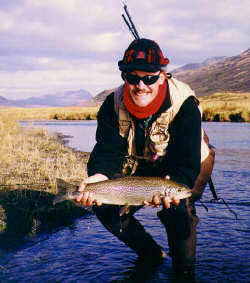 A fly fisherman of moderate skill can present the fly to the fish at any point in these rivers. The fish are abundant and the circumstances forgiving so the beginning fly fishermen can get into the action while sharpening their skills. 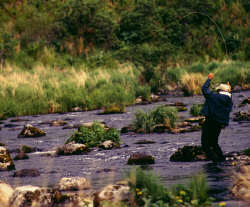 The wide variety of fish, fishing areas, and useable techniques will keep the most experienced fly fishermen entertained. King Salmon are available throughout the season in saltwater. Freshwater fishing for kings is best in June and July. Fishing for kings is accessed by boat out of the lodge, by visiting the out camp or by fly- out. They average 25 pounds and can go well over 40 pounds. 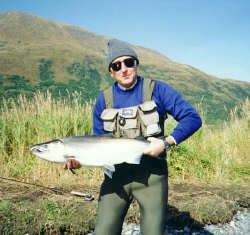 Pink salmon are available in July and August. Beginning in saltwater and moving into freshwater as the season progresses. Fishing for pinks is accessed by boat out of the lodge. They average 4 pounds and can go well over 8 pounds. 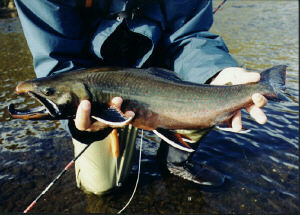 Rainbow trout are available throughout the season in freshwater. Fishing for rainbow is accessed by fly- out. They average 1 pound and can go well over 5 pounds. Silver salmon are available from July on. Beginning in saltwater and moving into freshwater as the season progresses. Fishing for silvers is accessed by boat out of the lodge, by visiting the out camp or by fly-out. They average 10 pounds and can go well over 20 pounds. Sockeye salmon are available in June, July and August. 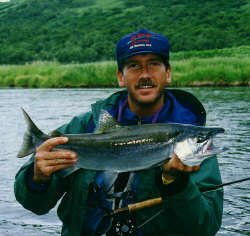 Fishing for sockeye is all freshwater and is accessed by boat out of the lodge, by visiting the out camp or by fly-out. They average 5 pounds and can go well over 8 pounds. Steelhead are available from mid September on in freshwater. 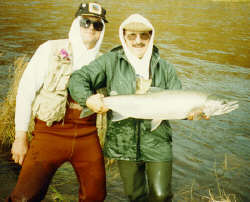 Fishing for steelhead is accessed by visiting the out camp or by fly-out. They average 8 pounds and can go well over 15 pounds. 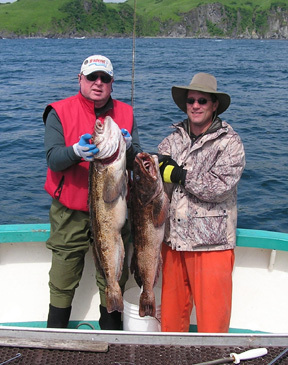 Lingcod are available by boat out of the lodge all season. They may not be kept until late summer. Lingcod average 10 pounds and get up to 30. Rock fish/sea bass are available by boat out of the lodge all season. They average 3 pounds and get up to 8. Rock fish provide some very fast action on conventional and fly gear.